When you were growing up, what was your favorite animal? For most kids, dinosaurs are one of the first ‘animals’ that they love and obsess over. Even if you didn’t love dinosaurs as a kid, chances are you acted like one around the house a time or two. Perhaps your love of dinosaurs has dwindled over the years, but maybe now you have kids of your own or grandkids even who are just now discovering their own personal dinosaur heroes. One of the most beloved of all dinosaurs is the T-Rex. Even if you don’t know how to spell its full name properly, the T-Rex is one of the most recognizable dinosaurs out there. Now your child can bring the fun of dinosaurs home with this unique Halloween costume. Digging up your back yard to find dinosaur bones might sound like a great idea to your child and maybe to your dog. Your lawn, however, probably won't appreciate it too much. This Child T-Rex Fossil Costume lets your child actually become the bones of his favorite dinosaur without any of the mess! It will let any boy or girl look like a walking, roaring museum exhibit. 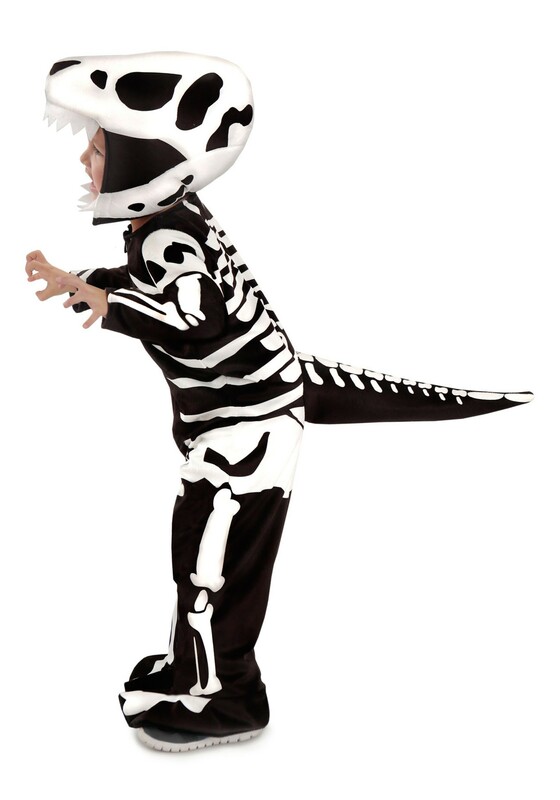 The 100% polyester costume has a zipper closure on the front of the jumpsuit for easy on and off and so it doesn’t interfere with the awesome dino skeleton on the back. The jumpsuit has attached foot covers and it comes with a polyfoam hood so your child will look like a dinosaur just risen from its ancient burial ground from head to toe this Halloween!